So few of us grow our own. Some try to start from seed. Get frustrated in the waiting process. After all, most of us are in it for the flavor, not the Botany. In fact, there are some herbs that are particularly hard to germinate. 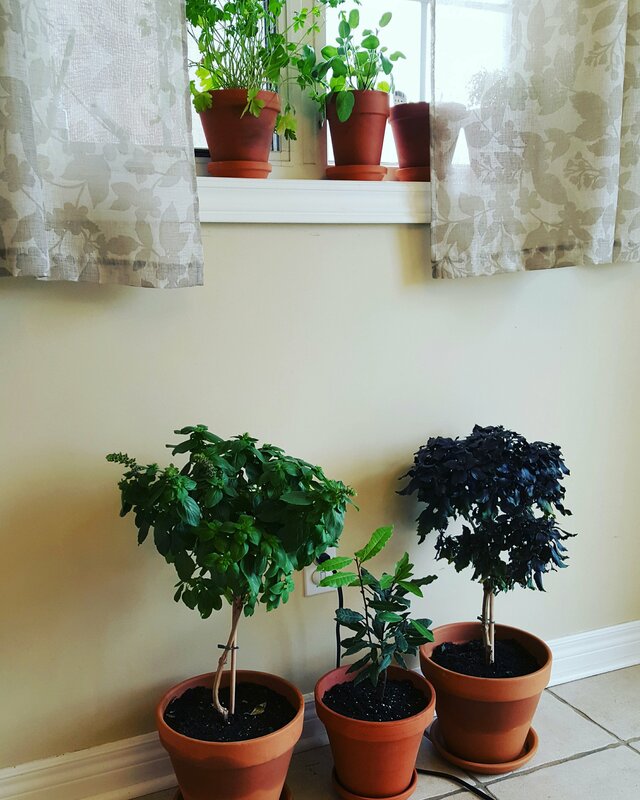 Best solution, by prestarted plants they range in cost but are not often above $4CAD I found mine for less and Sheridan Nursery. I found my clay pots from Walmart $1.23CAD each. Their matching drip trays $.47CAD. All together under $30 for 5 fresh herbs year round. If your worried about futilization, one the best ways to recycle coffee grounds is to use them in your plants. They also look fabulous, and smell inspiring. Fresh really does make a difference. Growing up I thought I didn’t like basil because all I had ever had was dried. When I got out on my own I started using fresh herbs. Basil is one of my favorites. Well said I really do taste the difference! It’s literally world’s away from dried!